It was probably not the kind of welcome the 234 migrants on board a rescue ship expected at the end of a six-day ordeal. A group of right-wing, anti-migrant people entrenched themselves on top of the Senglea bastions as the migrants landed at Boiler Wharf. 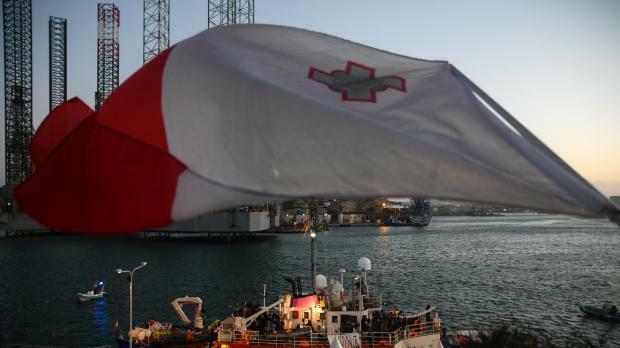 They first unfurled a banner saying 'Stop Human Trafficking' before hurling insults at the crew and the boat occupants as they waved Maltese flags. "You take our country to send people to Malta," the child is heard shouting to the boat occupants in a short video uploaded by Reuters photographer and former Times of Malta photographer Darrin Zammit Lupi. Only part of the tirade was captured on video, but the photographer said the insults then ranged from "we don't like black people" to "black people want to kill us". According to Mr Zammit Lupi, the mother, in her 40s, kept instructing the girl, around 10 years old: għid din (say this): prompting her daughter to repeat the words. "What was disgusting was seeing a young girl being manipulated to repeat such despicable terms. It's not the child's fault," he said. The hand gestures and protests by the anti-migrant group were spotted by one of the MV Lifeline's crew who was pictured giving them the finger. Earlier an incident was reported after the protestors came face-to-face with NGO workers, before police were forced to intervene.